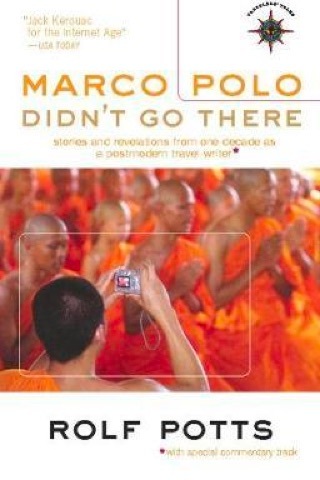 In 2008-published Marco Polo Didn’t Go There, American travel writer Rolf Potts presents an anthology of previously published works drawn from a decade of travel around the world. The pieces touch on a raft of issues, such as backpacker culture, overtourism, press trips and ecotourism and are an interesting and at times very funny page turner. I read almost the entire book on a single sitting, beachside in Bali (and have the sunburn to prove it), in part I confess because so much of the book was like reading a telling of my own travels. While the stories are unfortunately not specifically dated, Potts and myself were clearly kicking around some of the same destinations at around the same time. I couldn’t help but see myself in some of the tales—a sensation that certainly kept the pages flipping. While the book is rich in amusing anecdotes (the Rishikesh chapter is spectacular), many of which will be familiar to anyone who has travelled independently outside their home country, Potts does have a more serious tilt. This surfaces repeatedly through the book as he muses on questions revolving around travel. In Kontum (a little-visited provincial capital in Vietnam’s Central Highlands), the realities of Potts’ imagined time in the untouristed clashes with the realities of travel in remote areas. He has an unpleasant interaction with a local guy and finds himself asking, repeatedly, why am I here? Indeed, my own experience in Komtum was not dissimilar—it took me some years to untangle myself from one particular operator there. On another occasion, when Sam and I travelled to a remote area of Laos (Pha Udom) only because it was marked on a map, we found ourselves feeling likewise somewhat out of place. The locals, while not rude, were far from welcoming. A local kid asked a friend (in Lao), “Why do they keep smiling at me?” Indeed, what were we doing there? Slow travel is implied often through the stories, but, in a captivating chapter early in the collection, Potts deftly captures one of the joys of just letting travel take you where it wants you to. Hitching near the Polish border, he aims for a ride just over the border, but the convivial crew convince him to join them to Krakow. Later, while still in the car, he falls asleep and wakes later ... in Budapest. “What happened in Slovakia?” he asks of his companions. Self awareness and being mindful of your surroundings matters. When Potts is drugged and robbed in Istanbul, he later weaves it into his life experiences, which he refers to in passing as “resume weaving”. When my travelling companion and I were robbed in Mexico on our first trip overseas, my companion lost everything except for a sleeping bag, a camping stove and a copy of Milan Kundera’s The Unbearable Lightness of Being—much pop psychology followed on from that event—what do you really need in life? Had the thieves given us a message?! This is however a book about much more than backpacking and backpackers. A series of chapters, clustered under “The dubious thrill of press trips” will be of interest to anyone involved in professional travel writing. Potts neatly sums them up: “Even the most enjoyable press trips... are never created for the mere sake of enjoyment.” Indeed. The previously mentioned end notes make this also a handy text for the student of travel writing, as the notes are both instructive and revealing, pointing the reader to the thinking behind why something was omitted from or embellished in the published piece. In the next to final chapter, in a passage which will strike home to any long term traveller returning home, Potts is back home in Kansas and feels lost. Marco Polo Didn’t Go There will appeal to anyone who has done a bit of independent travelling—delivered with enough self deprecating humour to have you nodding and laughing at the same time. For the student of travel writing, it is a must read. Rolf Pott’s website also has plenty of material including some interesting videos, which are well worth a look.